Democracy is the most potent political idea in the world today, yet the future of democracy is increasingly uncertain. Key assumptions of democratic thinking and practice are being undermined by diverse sites of social and economic power on the one hand, and by dense networks of regional and global interconnectedness on the other. Distant localities are now interlinked as never before as states and societies are more tightly enmeshed in webs of international conditions and processes. 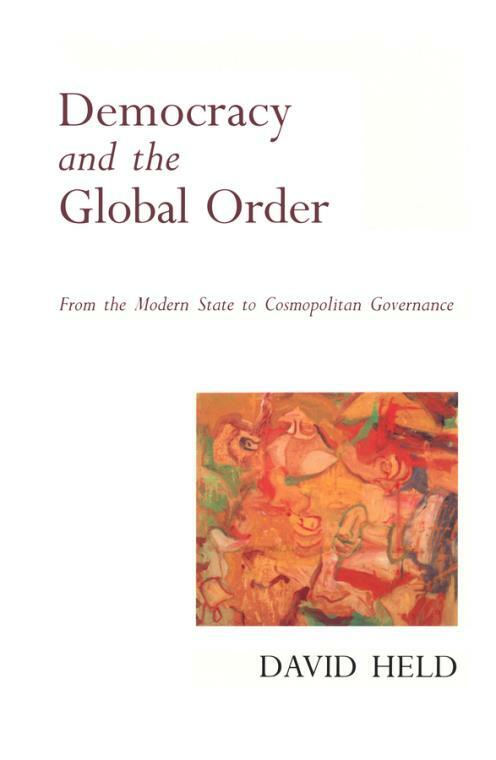 Democracy and the Global Order offers a highly original and systematic account of these issues. After critically assessing traditional conceptions of democracy in the first part of the volume, part II examines the historical development of the modern state in the context of the inter–state system and the world economy; it traces the rise and displacement of the modern nation–state. Part III explores the theoretical bases of democracy and of the democratic state, and the profound changes these concepts must undergo if they are to retain their relevance in the century ahead. Part IV champions a "cosmopolitan" model of democracy – a new conception of democracy for a new world order. The author argues that, from economic development to the fight against disease, new democratic mechanisms and procedures are urgently needed. The case is made for, among other things, the reform of the UN, the extension of the idea of regional parliaments, cross–national referenda as well as the enrichment of democracy at the level of cities, workplaces and neighbourhoods. 1. Stories of Democracy: Old and New. Part II: Analysis: The Formation and Displacement of the Modern State. 2. The Emergence of Sovereignty and the Modern State. 3. The Development of the Nation–State and the Entrenchment of Democracy. 5. Democracy, the Nation–State and the Global Order I. 6. Democracy, the Nation–State and the Global Order II. Part III: Reconstruction: Foundations of Democracy. .
8. Sites of Power, Problems of Democracy. 9. Democracy and the Democratic Good. Part IV: Elaboration and Advocacy: Cosmopolitan Democracy. .
10. Political Community and the Cosmopolitan Order. 11. Markets, Private Property and Cosmopolitan Democratic Law. 12. Cosmopolitan Democracy and the New International Order.